Class C final new for both programs. Nokomis’ Tyler Pelletier (11) returns a punt as Hermon’s Wyatt Gogan pursues in the Class C North championship game last Saturday at Hampden Academy. While perennial powers will face off in three of the four state championship football games this weekend, the Class C game features a pair of teams making history. The Class C state championship game between Nokomis and Fryeburg is the only one of the four in which neither participant has won a state title in the last 16 years. Wells (Class D) and Marshwood (Class B) are going for repeat titles. Brunswick won Class B in 2016, and Thornton Academy is playing for its first gold ball since winning Class A in 2015. Foxcroft Academy is playing for its first title since 2012, won in Class C before the addition of a fourth class. Portland’s title drought goes back to 2002. After winning its first regional championship Saturday with a 20-13 victory over Leavitt, Fryeburg is playing for its first state title since 1963. Nokomis is the only team playing for a title that has never won the gold ball. The Warriors are in just their 13th season as a varsity program. 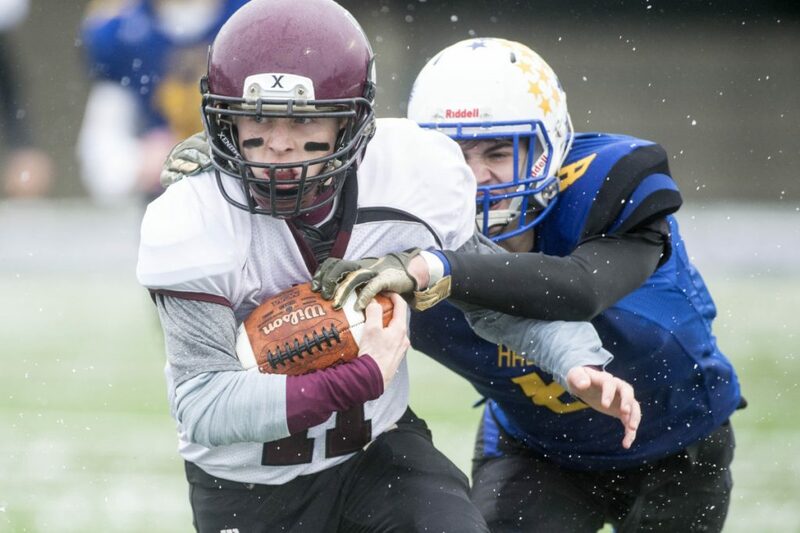 The weekend begins with the Class D championship game Friday night at the University of Maine’s Alfond Stadium in Orono, with Wells and Foxcroft Academy meeting for the second straight season. With Veterans Day observed Monday, the order for Saturday’s three games at Portland’s Fitzpatrick Stadium will be set Tuesday. Game times typically are 11 a.m., 2:30 p.m., and 6 p.m. In the past, the game featuring the teams with the longest combined travel time to Portland has been slotted as the middle game, with the two closest teams playing first. If Wells beats Foxcroft Academy in Orono Friday night, the Warriors will be just the second South team to win at the University of Maine since the four class format was reintroduced with the 2013 season. Oak Hill won the Class D state title at the University of Maine in 2015. Each of the Class B state finals played there went to the North representative, Cony in 2013 and Brunswick in 2016. Class C North teams also have won twice in Orono, Winslow in 2014 and Maine Central Institute last year. Wells is playing for its third straight state title. The Warriors won Class C in 2016 and Class D last year. This game is a rematch of last season’s title game, won by Wells, 48-0. Both Marshwood and Brunswick are making their fourth appearance in the Class B state championship in five years. Saturday’s title game is the third between these schools in five seasons. Marshwood won the previous two meetings. The Hawks won 44-18 in 2014, and repeated as champion with another win over Brunswick, 21-14, in 2015. Brunswick knocked off Kennebunk, 28-6, to win the state championship in 2016. Marshwood extended its dynasty with a 63-20 win over Skowhegan in the state game last season. In 2012, Thornton Academy won its first state championship in 24 years. On Saturday, the Trojans will play for their fourth gold ball in seven years. Thornton last won the state championship in 2015. The Trojans’ opponent, Portland, is no stranger to the title game either. This is the Bulldogs third championship game appearance in four years. Portland lost to Thornton in 2015 and Bonny Eagle in 2016.